The popularity of the E61 group among home baristas is unquestionable and its design is well represented among the site's espresso machine reviews. However, the last one reviewed having a heat exchanger was written over two years ago, so an update of a representative of this group and boiler design is overdue. For those who are new to the types of espresso machines available for the home, the heat exchanger boiler design may be confusing. Espresso Machines 101 explains the most popular boiler designs: Single boiler (sometimes called "single boiler, dual use"), heat exchanger (HX), and double boiler. This review presents the practical implication of the ECM Technika's HX boiler design, namely how to manage brew temperature. As you can see in this photo, the ECM Technika IV Professional is sharp looking. What may be difficult to judge from the review's photos is the ECM's top-notch finish quality. Even my wife noted that it was "prettier and more shiny" than some of the espresso machines she's seen pass through her kitchen. I noticed the tight tolerances on the body seams and nicely finished chrome fittings. The E61 lever and matching portafilter have extra appeal thanks to the black inlays; the steam and water tap both sport nifty looking joystick valves. It's perhaps a minor detail, but I also noticed that even the overpressure exit tube beneath the group was a solid metal chrome-finished piece rather than a simple plastic spout I've seen on some espresso machines. The Technika is available in three models: The base Technika IV, Technika IV Profi ("Professional"), and Technika IV Profi WT-WC (switchable between plumbed-in/water reservoir). The evaluation espresso machine is the last model, the Profi WT-WC, recognizable by its extra bling factor (e.g., toggle steam and water tap controls) and plumb-ability. To better understand how the barista varies the HX flush routine to assure consistent brew temperatures, see this short video. It demonstrates the required flush for the ECM Technika after it's been idle for a long interval, medium interval, and short interval. While in words it may seem complicated, it's easy to integrate the heat exchanger flush with your routine. For example, as shown in the video, flush brew water into the demitasse to preheat it. The Technika is tuned to reduce the need to flush (hence the "short" and "mini" flush described in the video), but this increases its shot-to-shot recovery time to a minimum of 2 minutes. The temperature reproducibility is best with recovery time around 3 minutes. Keep in mind as you watch the video above that the "sss-s-s" sound is the best indicator of how long you should flush (long, short, or mini) rather than keeping track of idle time. To put it another way, long "sss-s-s" sound = long flush + mini flush, medium-short "sss-s-s" sound = short flush, no or little "sss-s-s" sound = little or no flush. The Technika heat exchanger has been tuned for the production pace at home. Subsequently, the flushes are short and sweet, only amounting to a few ounces of water. That means more time between refills of the water reservoir (if not plumbed in) and less trips to the sink to empty the driptray. For those interested in more details, Ideal brew temperature management by HX espresso machine type presents the nomenclature used to categorize the key characteristics of the heat exchange espresso machines reviewed on this site. 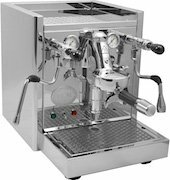 The Technika is a "Mixer" type heat exchanger espresso machine; its defining characteristics are modest flush, medium to slow recovery between extractions, considerable thermal memory, and initial rising then falling brew profile. As has been documented in numerous reviews on this site and elsewhere, the E61 group embodied by the Technika has earned its reputation as a barista-friendly design. 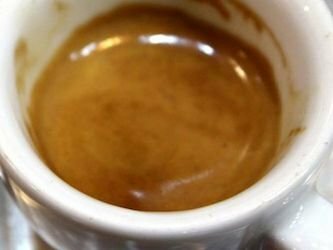 Minor errors in barista technique go unnoticed and even modest mistakes in grind settings, dose, or distribution have a good chance of yielding a drinkable espresso. This is unlike most entry-level espresso machines which, due to their uneven diffusion of water and often middling temperature control, punish any barista mistakes. Simply stated, the Technika is an espresso machine that delivers good espresso with ease and incrementally rewards better technique with incrementally better espresso. To judge the performance of the ECM Technika IV, we held a blind taste test using Counter Culture Coffee's Apollo single origin espresso. The ECM's challenger was the espresso lab standard equipment, the La Marzocco Linea PB. Both espresso machines used the same grinder (Compak K10 Pro Barista), dose, and pull time. The test was designed such that neither the baristas nor taster knew which cup was pulled from which espresso machine. Bob Barraza wrote: Realistically, I thought that it was a tie. If both shots had been served to me in sequence I would have thought them identical. With the benefit of side by side comparison, I noticed a slight increase in body, and sweeter aftertaste with the La Marzocco's shot. While brew temperature is frequently attributed outsized influence on espresso taste, judging from the look of the pours, I thought the slightly higher forgiveness factor of the E61 over the La Marzocco group produced results that alternatively favored better temperature control (La Marzocco) and reduced risk of channeling (ECM). Because the ECM Technika has been tuned for home use, it's important to allow it recovery time between extractions. If you exceed a pace of more than one espresso every two minutes for more than 2-3 espressos in a row, the brew temperature will start to decline towards the end of the extraction because the group has not reheated sufficiently. The Technika's pace is more than fast enough for most home baristas, assuming their typical service is for 1-3 people with occasional larger groups of 4-6 people. As explained in this buying advice video, espresso machines can be categorized into three classes: Entry level, prosumer/semi-commercial, and fully commercial. One of the key distinctions between the latter two classes is the speed of the steaming. A prosumer espresso machine will steam enough milk for a cappuccino in the 30 to 45 second range, while a fully commercial unit will be at least twice as fast. For home use, some may find the pace of a commercial unit too fast, since the faster steam time means less time to finesse the period when intentionally injecting a mixture of steam/air. The Technika comes standard with a "no burn" steam wand and a tip that favors low-volume, high velocity steam. The result is a modest steam pace around 45 seconds for 8 ounces of milk (e.g., largish latte) and easy development of microfoam. After purging condensation into the driptray, place the tip into the milk, flip the toggle wide open, then lower the pitcher until the outgoing steam makes a "sss sss sss" sound like ripping paper to inject a mixture of air/steam. This initial stretching phase lasts for around 25 seconds, until the pitcher feels warm to the touch; raising the steam pitcher higher should cut off the tearing sound, introducing the texturing phase that mixes the milk/microfoam. This second phase lasts about the same time, around 25 seconds. It may be helpful to place the tip close to the side of the pitcher and a slight angle to encourage a gentle rolling motion in the milk. The no-burn steam wand is easier to wipe clean because milk doesn't bake on easily. Don't forget to purge a bit of steam into the driptray after texturing the milk to assure the tip's tiny holes don't clog.